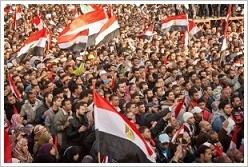 Anniversary of the Revolution: End of Emergency Law! 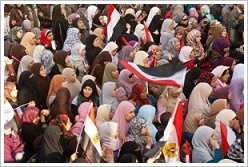 On 23rd of January the newly elected Egyptian parliament hold its first session. On 24th of January the ruling Supreme Council of the Armed Forces announced that emergency law would be lifted from 25th on, the anniversary of the Egyptian revolution. It would still apply in dealing with cases of “thuggery". Under the emergency law which was in effect since 1981 political gatherings and protests were prohibited and people could be detained without trial. On the occasion of the anniversary the military ruler also released nearly 3,000 prisoners. Technische Universität Berlin has established a satellite campus in El-Gouna, Egypt to act as a scientific and academic field office in order to offer German higher education standards and legislation in terms of both their content and their structure. Students can choose between three technological master’s degree programs – in Energy Engineering, Urban Development, and Water Engineering.. All three of them are scheduled to begin in the winter semester of the 2011/2012 academic year. Each program hosts 30 students per year over four semesters. The tuition fee will be 5,000 EUR per semester but scholarships will be offered. Further master programs, including Management and Business Plan Formulation, Logistics, Innovation Management and Entrepreneurship, Health Care Management and Vocational Training are currently under discussion. The costs of construction, service, maintenance, and operation of the building infrastructure are all being assumed in full through Samih Sawiris, the head of Orascom Hotels und Development (OHD), who studied economic engineering at TU Berlin from 1976 to 1980. Update: In fact, the found wasn't thus accidentally. The tomb was already found one year ago and immediately closed again in order to protect it against possible thugs during the Egyptian revolution. In the meantime the coffin has been opened. As expected it is in good condition and contains the intact, carefully wrapped mummy of Nehmes Bastet. Yesterday the found was officially announced: Accidentally, a deep burial well was found during a routine cleaning carried out by a Swiss archaeological mission on the path leading to King Tuthmosis III’s tomb in the Valley of the Kings. It is the only tomb of a woman not related to the ancient Egyptian royal families ever found in the valley. However, during the 22nd Dynasty the High Priests of Amun had a nearly royal status and the tomb belongs to Nehmes Bastet, the daughter of a high priest from this period. She was a singer of Amun Re in the Karnak Temple. 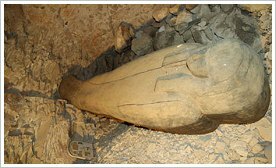 As far as is known the tomb consists of a shaft leading to a single undecorated and intact chamber. There, the researchers found the wooden sarcophagus of Nehmes Bastet painted black and decorated with hieroglyphic texts. Probably the singer's mummy is still inside. Other finds inside the tomb show evidence that the tomb which will get the number KV64 originally dates back to the 18th Dynasty. 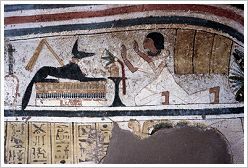 Dr. Omar will held the next Mummification Museum lecture on Sunday, 22nd of January, 2012, 7 pm. 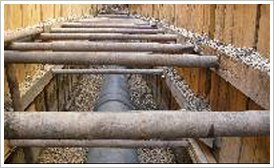 The dewatering project should reduce the groundwater level in order to prevent further damages to the temples on the west bank. Most badly affected are the temples of Ramses III (Medinet Habu), Amenhotep III (Kom el-Hettan), Ramses II (Ramesseum) and Seti I. 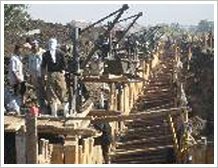 The project is realised with financial support of USAID. On Sunday, 8th of January, 7 pm, Suzanne Onstine will speak on the "Life Cycle of a Theban Tomb". She is Assistant Professor of Egyptology & Ancient History at Memphis University. Her current research project is TT 16, the tomb of Panehsy in Dra Abu el-Naga, Luxor West Bank. 30 counties from across the African continent announced their participation in the new Luxor African Film Festival, which will take place from 21st to 28th of February, 2012. It is planned to produce at least 15 films throughout the events and to assist 45 young filmmakers in their careers. Award-winning filmmakers will teach film students in special workshops. Of course new African films will be featured, too. For example: A Screaming Man (Chad, winner of the Jury Prize at the Cannes Film Festival in 2010), All That way for Love (Kenya, also award-winner), Burning in the Sun (Mali), Everyone’s Child (Zimbabwe), La Nuit Du Destin (Algeria) and Congo River (Congo). The films Ehky Ya Schahrazad and L'ingrat originate from Egypt. Don't worry. They will be screened in English. Where in Luxor? Until now there is no information on it. By the way: The first public film screening worldwide took place in Manhattan in 1894. In 1896 people in Egypt watched the first film screenings in Alexandria and Cairo. In 1897, there were inaugurations of the first cinemas in both cities. 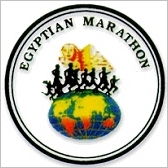 On 27th of January the 19th Egyptian Marathon will take place in Luxor (see our December news). 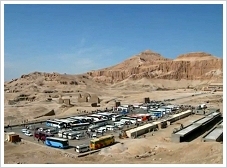 The race will start at 7 am beneath Hatshepsut Temple on the West Bank of Luxor. Follow the link for more information, application form and race map.